Over 3 months ago, I published an announcement and subsequent drawing of a competition to win 1 of 100 Windows Vista caps. I knew from the beginning the logistics of sending out 100 gifts would have caused problems both financially and physically. Luckily, Microsoft Australia came to help me out by distributing the caps through their channels. However, the three months that followed didn’t go quite as plan. What was quite simply, a dropoff at the reception of Microsoft Australia’s Melbourne office, turned into the perfect plot for a Sherlock Holmes story. I won’t dive into the detail of how I got the caps on the counter, in short, it was a lot of work. I put it on the counter when I got in, and was still on the counter when I left. Somehow, nanoseconds between the elevator door closing and the receptionist opening her eyes again, the box vanished. It was as if MIB took the box, and then flashed everyone. The box wasn’t finger-tip sized (as you can see from this archive photo). Perhaps it fell down an enormously large crack in a corner of the wall. Who knows. It was gone, and there was nothing I could do about it. 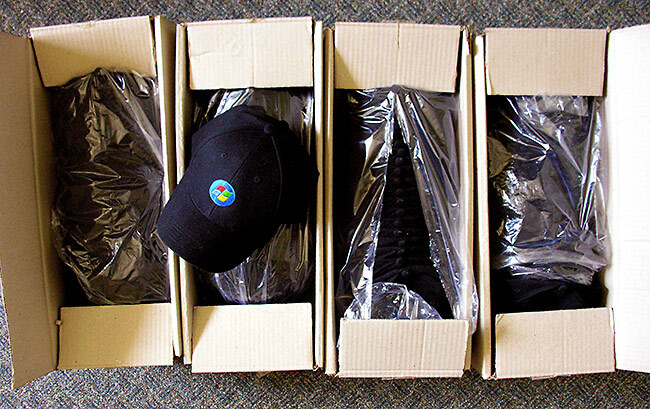 Luckily, Aaron from Microsoft in Redmond was generous enough to fulfill the request for another 100 Vista caps to make sure those who were promised one, got one. These caps were ordered, delivered and finally distributed in just weeks. Special thanks to Aaron and Bernard! Some of you may have received your caps today. If you haven’t, they will be there soon. You might notice the dissimilarities between the caps you receive and the photo of the caps I originally planned to distribute. That is because these are not the same caps. These were ordered from another merchandising vendor which had a different design to the originals. Thanks for sorting it out and happy that I’ve received mine. They look great, unfortunetly i never read your blog before a month ago :(. Anybody know where i can purchase these? If you end up with any spares or the orb ones rematerialize, I’d really love to get one! Otherwise, keep up the great job with you site. I whad wondered about that.. i just figured you sold them for a handful of chips in Vegas to get that one last win…. NOW I don’t feel bad for not winning one, since I already have one of these new ones. The Vista orb one looks better in my opinion. I was wondering about the cap, wanted to wear it vista launch event. but its never arrived. Now i know the reason. Thanks MS for helping Long. Waiting for mine to arrive. I want the Orb one, not.. this. I have an “A new day” T-shirt. That works for me! I do say the original ones look better. Mine arrived today, thanks Long.